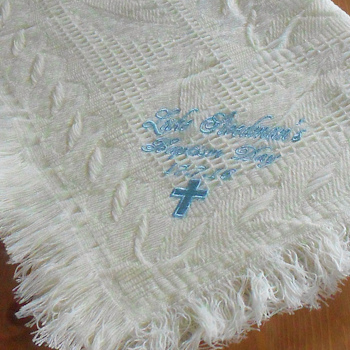 Cream Christening or baptism baby shawl in soft knit with fringed trim, personalised gift for baby on their special day. Pattern knit cream coloured baby shawl made of fine quality acrylic. Delicate knit with a fringe around the egdes the blanket measures 120cm x 120cm. Enter the text you want embroidered in the text box. We arrange the layout so it looks nicest. Dates are normally placed under the name. Choose your text thread colour and letter font style. Select if you would like to add on a little embroidered motif of a cross, heart or star. We will sew this towards one corner of the baby shawl.